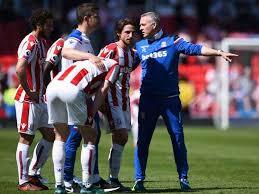 Stoke City football club were relegated from the English Premier League (EPL) after losing 2-1 to Crystal Palace in Saturday’s fixture. The result means that Paul Lambert’s men are now currently occupying the 19th position (second bottom place) on the English topflight log with 30points from 37 games. With only one EPL game remaining, Stoke City will need at least more than 4 points to be saved from the relegation zone. With fourth-bottom place, Swansea and third-bottom place, Southampton playing each other on Tuesday, it is impossible for Lambert’s side to collect enough points to avoid relegating into the Championship. Stoke City have enjoyed ten seasons in the Premier League but a run of 13 games without a victory this season ensured that the streak will come to an end.